At Anchor we are committed to ensuring the people living and working with us are kept safe, are supported to stay well and to live full and happy lives and remain at the centre of any decision. 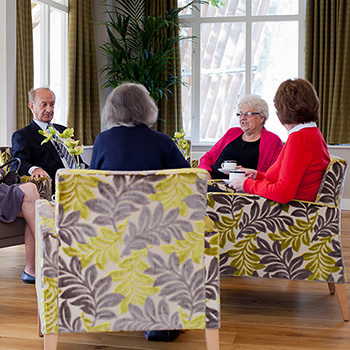 The Anchor Group is England’s largest not-for-profit provider of housing and care for older people, we take our safeguarding duties towards our customers and staff extremely seriously and have good mechanisms in place to ensure their wellbeing. We specially select our staff for their personal qualities as well as their training and formal qualifications. We have a programme of mandatory safeguarding training and all staff being employed to provide any form of personal care undergo an enhanced DBS check. Across all of our services we work hard to get to know our customers and their families, and build relationships that enable us to have open and honest conversations about all aspects of the care and support we provide. At Anchor we take all concerns seriously and ensure that should anyone ever have any worries they know where to go for help. All of our care services are independently reviewed by our regulators and our own Anchor Safeguarding Board, which sits on a quarterly basis and is chaired by Anchor’s Care Services Director. We recognise that sometimes things can go wrong and make sure we learn and implement real changes when they do. Anchor is a proactive organisation, committed to staying up-to-date with safeguarding developments and supporting people through changes in the social care arena as they arise. We are part of an alliance of leading housing and care providers, alongside Housing & Care 21 and Hanover, which share best practice and we also work closely with local authority safeguarding boards around the country to devise common approaches.